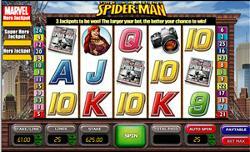 Welcome to Cryptologic's Branded Slots, a place where super heroes reign supreme in the slot world. You will find that these slot games appeal to both penny slot players and high rollers alike due to the myriad of coin sizes available; more than any other slot game online. Thus, out of the many games listed below, here are some highlights of some of our favorite slots we know you will want to download and play at our Cryptologic casinos. 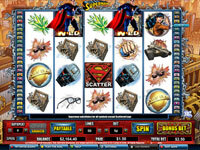 Superman Slots is a 50-payline slot with a 10,000-coin jackpot, the Man of Steel comes to life in this superb slot game. With bonus features including wilds, scatters, free spins, and a super bonus game; Superman will always save the day. This ancient Egyptian 9-payline theme-based slot is a popular favorite among slot players. This game is a progressive bonus video slot that is sure to please as it features wilds, scatters, and a magnificent bonus round. If you love cleopatra slots, this Cryptologic slot is one of the best. Another superhero among heroes is this 25-payline slot game featuring an intricate web of wilds, scatters, free spins, and a special bonus round. With coin sizes ideally suited for all slot players, you will have a great time as you vie for the progressive jackpot.